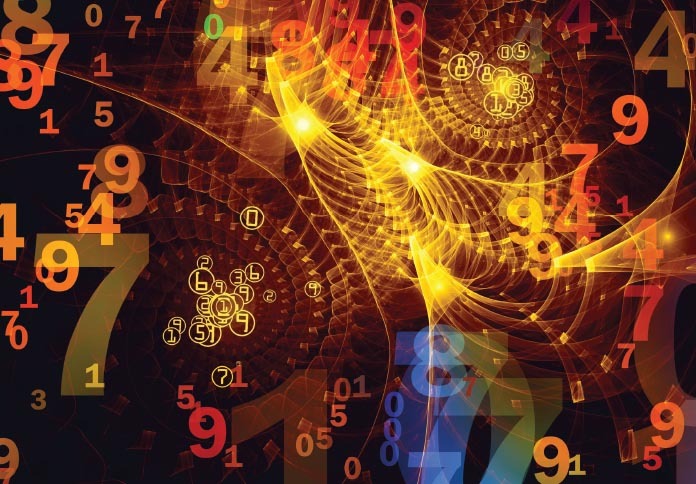 Numerology is the use of numbers to determine lucky and unlucky energy flows within one’s environment, and this is applied to individuals using the numbers of their date of birth. Much of this aspect of numerology can be traced back to Western mathematical discoveries, including those of the Greek philosopher Pythagoras. Among the many discoveries made was that individuals who shared the same “dominant numbers” would have similar personality traits. These “dominant numbers” were directly derived from the individual’s date of birth, and this led Pythagoras to the conclusion that there had to be a specific numerical relationship between someone’s behaviour, personality and attitude in life. Since Pythagoras, there have been many scholars who have carried on further research to broaden the spectrum of his numerology concepts. To the Chinese, numerology has always been associated with the Magic Lo Shu Grid, which was discovered around 4000 years ago. The intrinsic patterns of the base chart, together with the way the numbers move about the grid, are believed to offer clues on the characteristics and outcomes of events within the environment. The Lo Shu grid is the central principle behind “Flying Star Feng Shui” and also used in the interpretation of individual birth charts. The only difficulty posed is that the principle calculation of date of birth is based on the lunar calendar, while we are used to using the Gregorian calendar. As such, before we can even use numerology to read our birth chart, we need to convert the Western date to the equivalent lunar date. Fortunately, there are many websites available these days that makes it easy to convert between the two calendars. 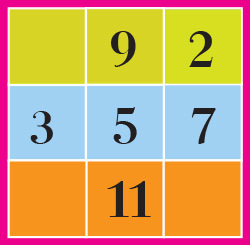 The Magic Lo Shu Grid is shown on the right, and if you were to add up the numbers horizontally, vertically or diagonally, you will find that the sum comes to 15. The 3 rows of the grid represent the three dimensions of one’s personality; the Intellectual dimension, the Spiritual dimension, and the Material dimension. A missing row corresponds to a person whose persona is lacking in the characteristics of that dimension. The three numbers on the top row are 4, 9 and 2; these symbolize the intellectual capability and motivation, as well as the mental processes of thinking, analyzing, imaging, creating and so forth. They also represent the conscious awareness of the inner self. When combined with numbers on the material plane, it suggests awareness of facts and figures as well as desire for material gains. When the chart is devoid of numbers in the two other dimensions, it means the chart is completely out of balance and can be interpreted to represent someone who thinks so much that nothing can be achieved due to inaction. To the Chinese, numerology has always been associated with the Magic Lo Shu Grid, which was discovered around 4000 years ago. The intrinsic patterns of the base chart, together with the way the numbers move about the grid, are believed to offer clues on the characteristics and outcomes of events within the environment. The central numbers of 3, 5 and 7 represent the emotional nature of the person, including the degree of feelings, instincts as well as intuition. Having too many of the central numbers indicates someone of excessive emotions. If someone has many 5’s, it can mean the person is extremely emotional, while having too many 3’s indicates a quarrelsome character. And excess of 7’s indicates a person who uses emotions for their own selfish gains. If there are missing numbers in the intellectual dimension, it suggests someone who is ruled by their heart and who reacts to situations in an emotional rather than logical manner. If there are missing numbers in the material dimension, it can mean someone who is willing to give up all material needs just to satisfy their emotional needs. Too many emotional numbers in the chart generally means that logical and rational thinking are lacking in that person. The numbers 8, 1 and 6 represent material success, abundance, wealth and prosperity. These numbers can also represent a lifestyle that too opulent, as well as an arrogance caused by an excess of material possessions. 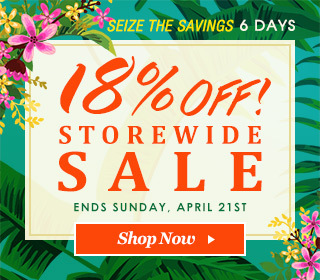 When these numbers dominate your chart with an absence of numbers in the other two dimensions, it suggests a personality that is cold and devoid of feelings – someone who is only interested in the pursuit of wealth and power. If there are missing numbers in the intellectual dimension, it suggests a wealthy person who wastes away his riches, while missing numbers in the spiritual dimension indicates someone unwilling to share his wealth. So how does one construct one’s birth chart? Say you were born on 12th March 1953, the first thing you need to do is to convert the Western (Gregorian) date to the equivalent Lunar date. You can do so online (http://www.hko.gov.hk/gts/time/conversion.htm). After conversion the equivalent lunar date would be the 27th day of the 1st month in the year 1953. The date would be written as 27.1.1953 (lunar date). At this point, you should be aware that for some years in the Lunar calendars, there are 13 months instead of the standard 12 months in the Western calendar. The numeral zero is not used as this is regarded as a complete number, appearing at the end and the beginning of the sequence of 1 through 9. Construct the birth chart by writing the numbers that appears in the lunar date in the grid following the sequence according to the Lo Shu grid. The chart on the right shows that it has 2, 7, the double 1, 9, 5 and 3. Take note that we omit numbers that do not appear in the lunar birth date. 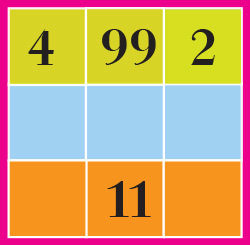 For this chart, we can see that as the numeral 1 appears twice, so the dominant number is 1. You will find that there will be charts that possess more than one dominant number, in which case, the person will exhibit the characteristics as a combination of the dominant numbers. In some rare cases, extremely balanced charts will not have a dominant number, as there are a maximum of eight numbers in a birth date. In this case, that person’s personality will constantly change as they move through life, although never in excess. We can see from Justin Bieber’s chart that he has two dominant numbers of the double 9 and the double 1, with missing numbers in the spiritual plane. His chart has all the numbers in the Intellectual dimension with none in the spiritual dimension. As such, this is someone who is motivated by his head but never by his heart. 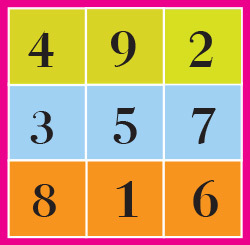 The three numbers 4, 9 and 2 indicate someone of above average intelligence, and of strong analytical and creative abilities. However, because his chart is missing the Spiritual essence, he would be considered selfish, arrogant and self-centered, thinking only about how to better himself with no consideration for the needs of others. Furthermore, the double 9’s aggravate this trait of self centeredness. The double 1’s in the Material dimension indicate good potential for temporary great wealth, but he lacks the 8 and 6 to balance and lengthen his material gains. 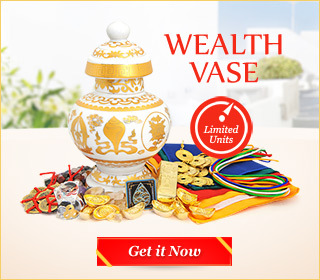 His prosperity luck looks very short term; however, when it materializes, it can bring him lots of money. Overall, this person consistently lives his life in a manner that creates continuous bad karma – seeking only quick material gains at the expense of others. His career as a singer has already shown this analysis to be true, where his popularity rises very quickly, but just as quickly degenerates to the opposite.